Do you need garden clearance in Wanstead? We have the ideal remedy! For more than a decade we’ve been providing garden clearance Wanstead householders depend on and happily recommend to neighbours, family and colleagues. They really like our fast, flexible services and affordable prices. And we think you will too! 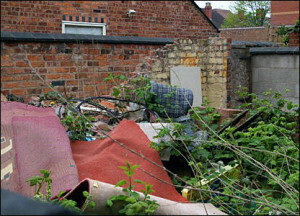 Garden clearance is a tedious job and garden waste disposal can be a serious hassle. But using Away With It garden clearance services couldn’t be more convenient. Our versatile and experienced work force will clear all of your garden rubbish in no time at all. And all at an affordable price. Garden furniture including timber benches, aluminum chairs, glass top tables etc. Garden structures such as sheds, greenhouses, playhouses, paving, fencing. We can take apart these objects as well. Play equipment from paddling pools through to more substantial items including trampolines, sandpits, swings, slides, climbing frames etc. We can also remove chemical substances and liquids, for instance, plant feed, herbicides, paints, varnishes, timber stain products. We are certified waste carriers. You can count upon us to carry out a totally competent job and deal with all your waste products responsibly and lawfully. We are open for business 7 days a week from 7am to 11.30 pm. Evening and weekend bookings can always be scheduled for your convenience. We deliver a quick, on-demand waste removal service. When you require us we are merely a phone call away. Appointments are in two hour slots and we’ll make sure to call in advance to let you know when we’ll be there so you’re not left dangling. Our clear-cut pricing means there will never be any nasty surprises when the job is done. The price we quote is the price you will pay with no concealed add-ons. We always sweep up when we’ve finished clearing your refuse and leave your yard tidy and clean. To talk about your needs for garden clearance Wanstead get in touch with us without delay on 0208 504 7390. We’re here 7 days a week from 7am to 11.30 pm to answer your phone call. Our skilled team members will be happy to address your questions and offer a cost-effective free estimate. Or you can provide your details using our quick and convenient request a quote form and we will respond to you in a flash.